Hello again, stamping friends! I hope that you had a fabulous weekend, and if you celebrated Easter, that it was a good one for you. Our family is actually having our dinner tonight, to combine Easter with my sister-in-law’s birthday 🙂 I always look forward to getting together with the family that lives close to us, as we have lots of family who live away, and we don’t get to see them all that often. Today I have a special Guest Stamper to feature – Lynn K. is one of those customers who quickly becomes a friend; she is such a sweet and kind person! Lynn had told me about a centerpiece she had made for her table for Easter, and I asked her if I could share it with you. I think it’s a fabulous idea – and wait until you see the cute twist she added! Isn’t this adorable?! Lynn stamped the flowers using the Flower Shop stamp set, punched them out using the coordinating Pansy Punch, and attached them onto stems. 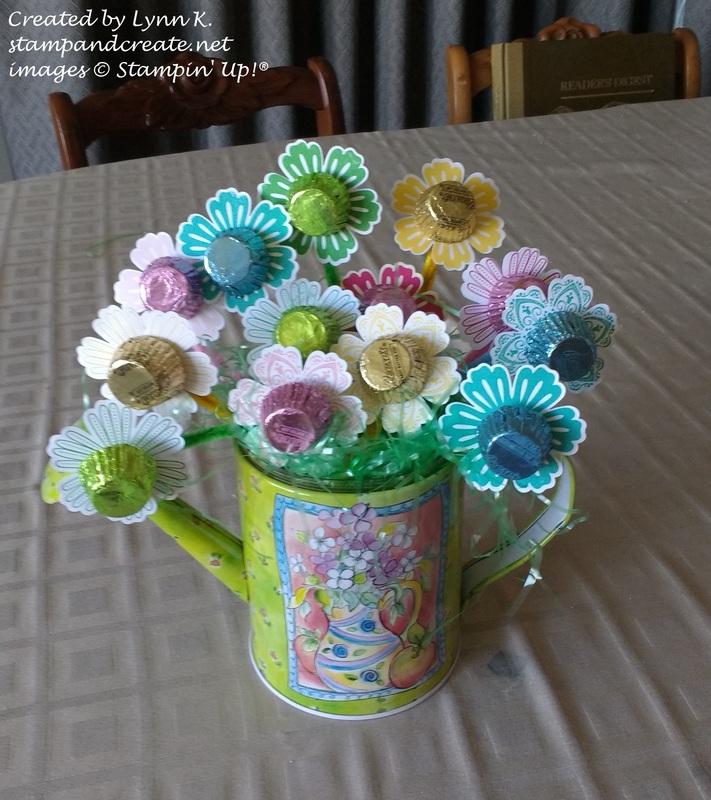 She then attached a little chocolate treat to the middle of each flower, and – here’s the twist – put them all into the cutest little watering can! Anyone else would have used a vase, which of course is perfectly acceptable – but I love how the watering can just adds that Spring touch! Thank you Lynn, for sharing your project! I think this would be a perfect arrangement for a spring or summer lunch or dinner, or a great for a birthday celebration. If you have a project you’d like to share, please send me a picture to debsmart@shaw.ca I’d love to have you as a Featured Stamper! One quick reminder before I go – there’s only 3 days left for Sale-A-Bration – so now’s the time to get your order in, and get the Free products that you want!